BeerPod « Roll Out the Quevedo! A new feature at ROTQ: BeerPod. A close look at what is in the fridge and iPod of our editors and friends. 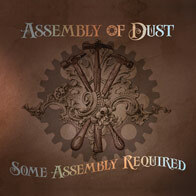 iPod: Assembly of Dust: Some Assembly Required. If this isn’t in your iPod…it probably should be. AOD is not your typical “Jam Band”, not in the mold of Phish but more akin to Widespread Panic. Jam Bands are known for long elaborate musical improvisation with sophisticated musical arrangements. AOD doesn’t often go for the long, but plenty of the latter. This Vermont based outfit (like Phish before them) has borrowed on this album from some of the music worlds most gifted artists for collaboration. Appearing on this album are Richie Havens (Woodstock), acoustic savants Tony Rice and Keller Williams, as well as Phish’s Mike Gordon. But the best collaborative moments are offered by Moe’s guitarist Al Scheiner and banjo virtuoso Bela Fleck. This album has a little bit of everything and will definitely enhance your library! Listen to the album free at this link! Assembly of Dust latest album is outstanding. Pairing beer with music is not easy and in many cases unnecessary, but we’ll give it a shot. The AOD album mentioned above is electic, diverse, and sophisticated. A beer that is new to the Wisconsin beer scene that is all the above is the latest work of genius from Dan Carey and the New Glarus crew. To the dismay of many earlier this year the standard “Hop Hearty IPA” began to disappear from store shelves. It was replaced by a marvelous new addition Moon Man No Coast Pale Ale. Not as hoppy as the former, but a smooth substitute. Hop Hearty has been downgraded to a a Beer we’ve known and loved (past tense) at the New Glarus site, intimating this might be permanent. 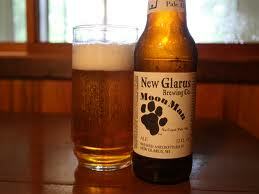 The Hop Hearty was better, but if Moon Man isn’t in your fridge, it probably shoud be!